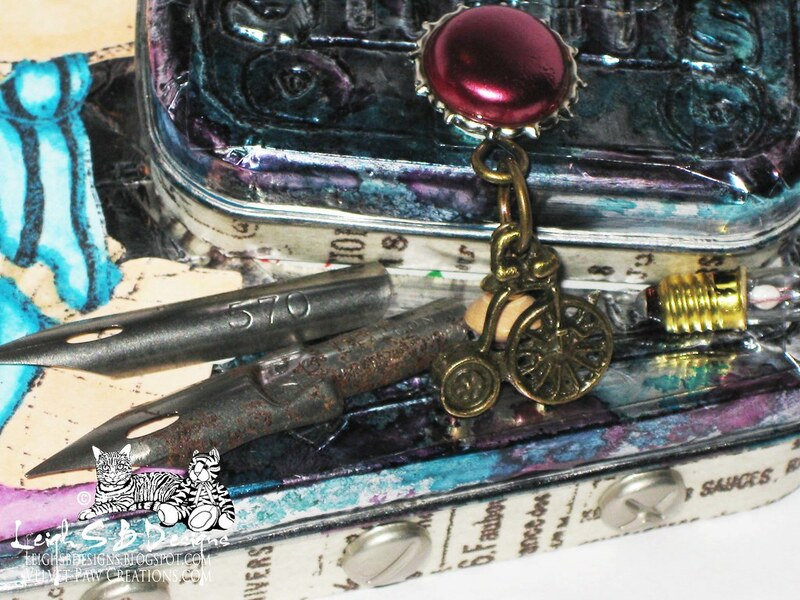 Velvet Paw Creations: Steampunk Ella Sitting Pretty - InkStained Roni Altered Altoid Art Festival Blog Hop! 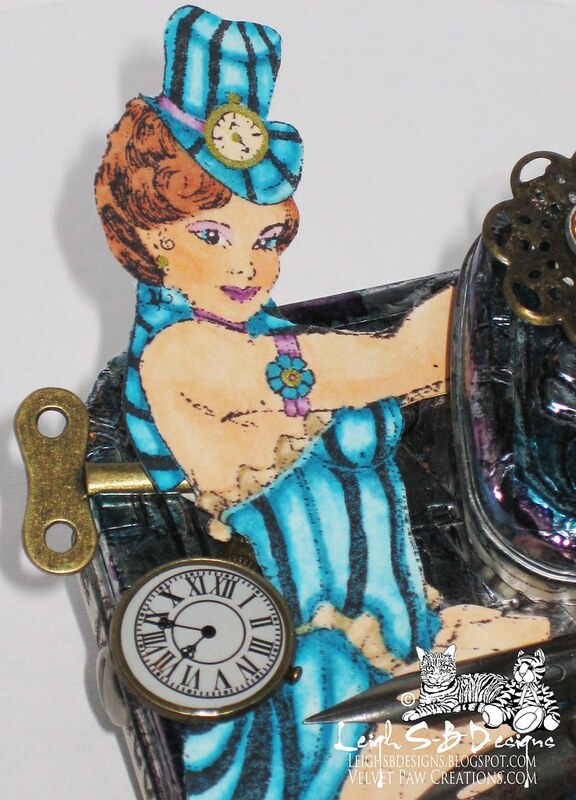 Steampunk Ella Sitting Pretty - InkStained Roni Altered Altoid Art Festival Blog Hop! 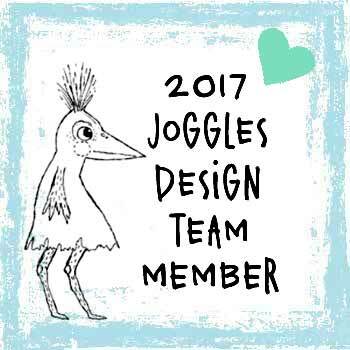 Today we're celebrating my friend's 5th blog anniversary/birthday! Congrats Roni on your awesome milestone! 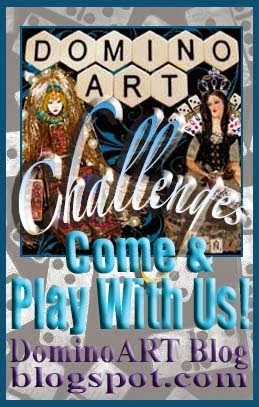 Roni of Ink Stains is hosting an Altered Altoid Art Festival blog hop today! 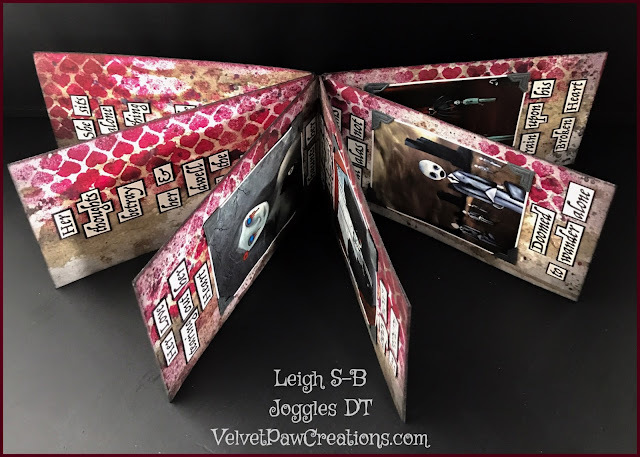 See the linky collection below to continue on your altered tin hop and check out Roni's post about the event here! 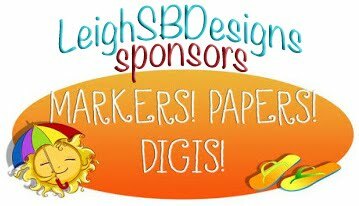 She's giving away prizes so come and join the fun! Here's my altered altoids tin contribution to the festivities. I used two altoids tins, a regular one and a 'Smalls' one too, which Roni graciously provided for me to alter. E000, 00, 01, 02, 13, 15, 43, V01, 06, BG02, 05, 07 and added some metallic gold details with a gel pen. 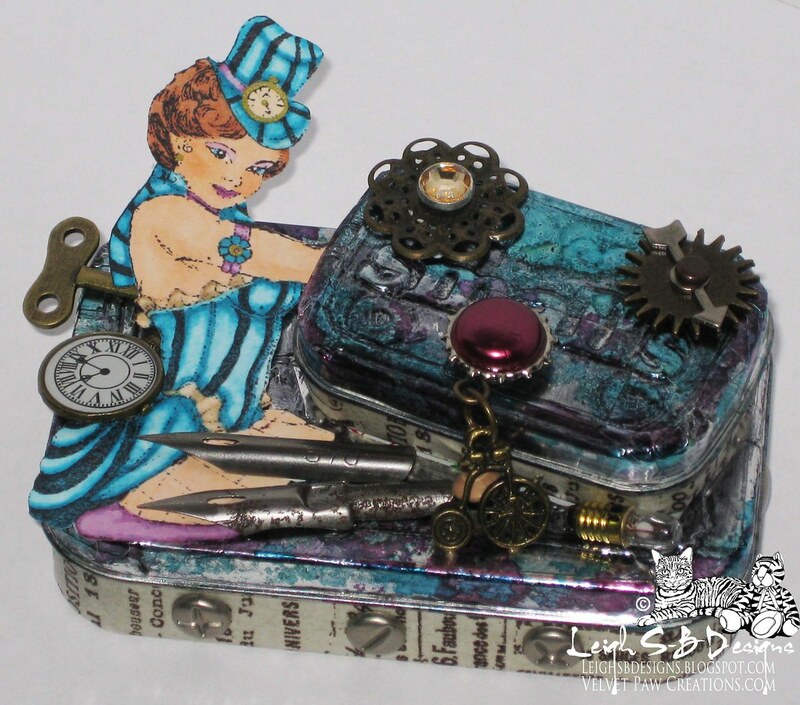 I applied Tim Holtz Idea-ology Nostalgic Tissue Tape to the bottom edges of both tins and cut up pieces of Ranger Inkssentials adhesive back silver foil tape sheets to the lids. I used a stylus to draw attention to the word 'Smalls' and other details on the tins that I liked and the lid of a pen to impress 'faux' rivets into the metal. I then applied Jet Black StazOn re-inker to a piece of Cut & Dry foam and covered all the metal areas and then buffed away most of the black so it stayed in all the grooves. I then randomly applied Adirondack Alcohol Inks Current and Stream to both lids. I adhered the small tin to the lid with E6000 adhesive and then Ella with Aleene's Fast Grab Glue with a pop dot behind her to prop her up. 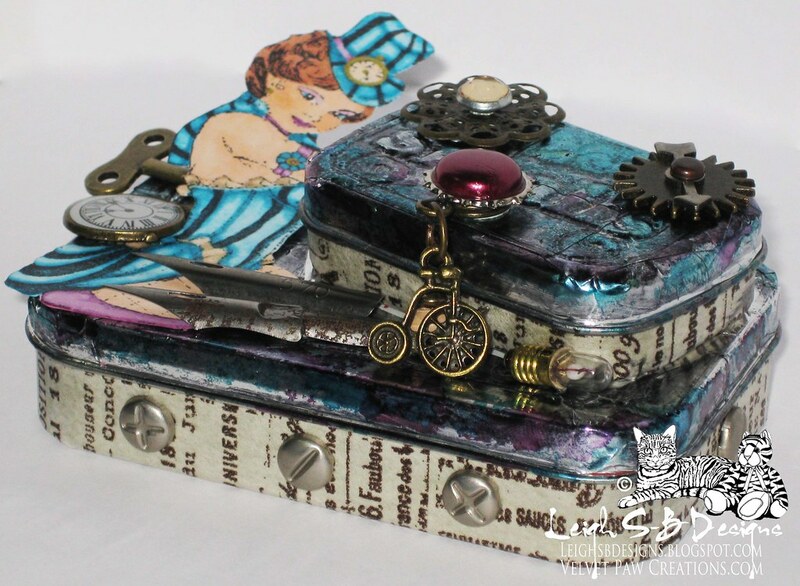 I had a ball adding all the various Steampunk-esque embellishments to my altered tins and plan to keep this one on my desk with all my loose embellies tucked inside! I finished off the look with screw head brads, with the arms removed, adhered to the sides of the larger tin. I love it! 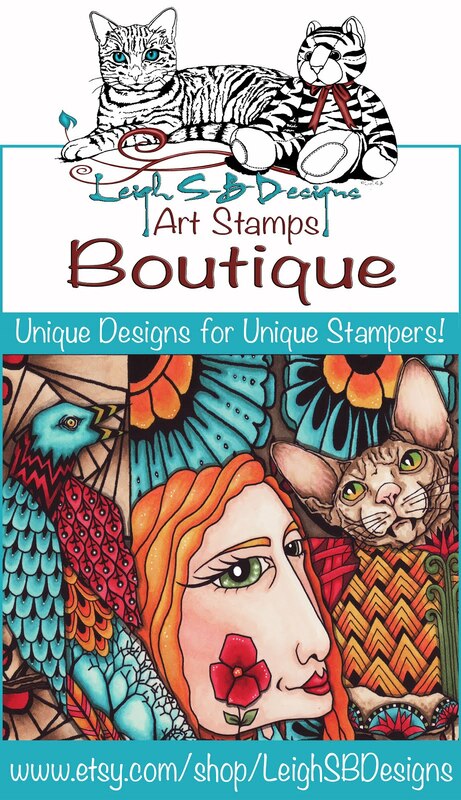 FYI: a lot of these embellies and loads more goodies are available at SkyBluePink.com and Blockheads Paper Arts! Thank you so much for stopping by my blog today! 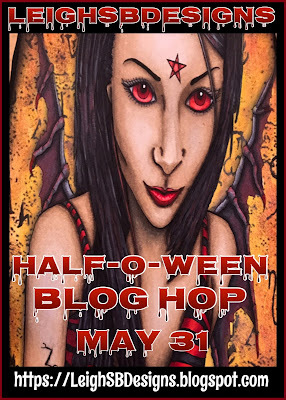 I hope you're having loads of fun hopping around Roni's Blog Hop Art Festival ;0) See the linky collection below to continue on your adventure! Love that you used the small tin on the big tin! Yours is great! Aren't you the clever one! I love how you stacked the small tin on top of the larger one. 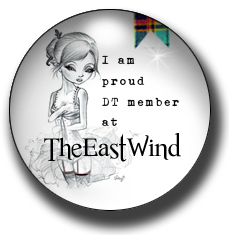 Also love the steampunk theme -- very cool! Leigh your tins are awesome!!! You know how much I love steampunk so it makes it extra special. The colors, images, embellies...they are all perfect! 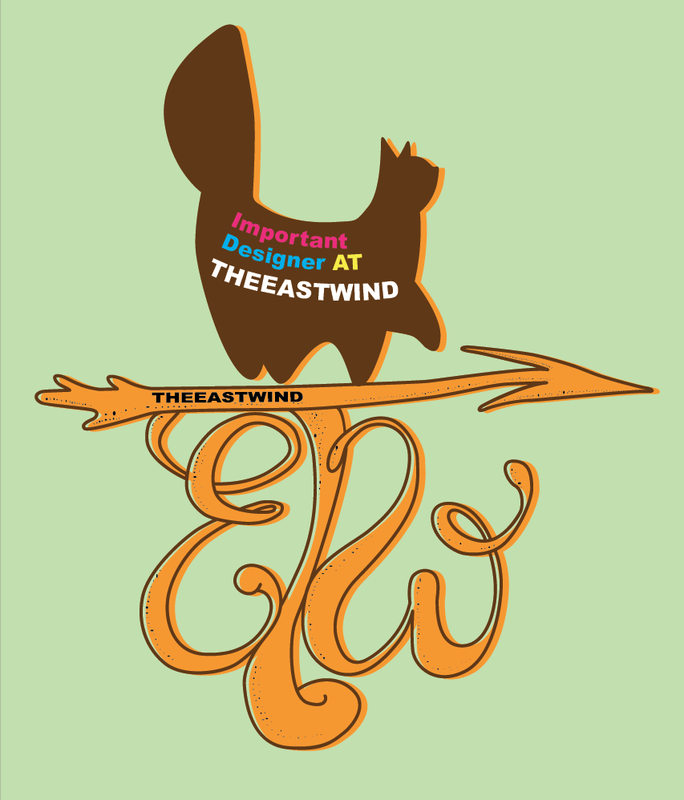 Thank you so much for taking the time out to create such a beautiful piece and sharing it with us all! Talk about IMPRESSIVE. 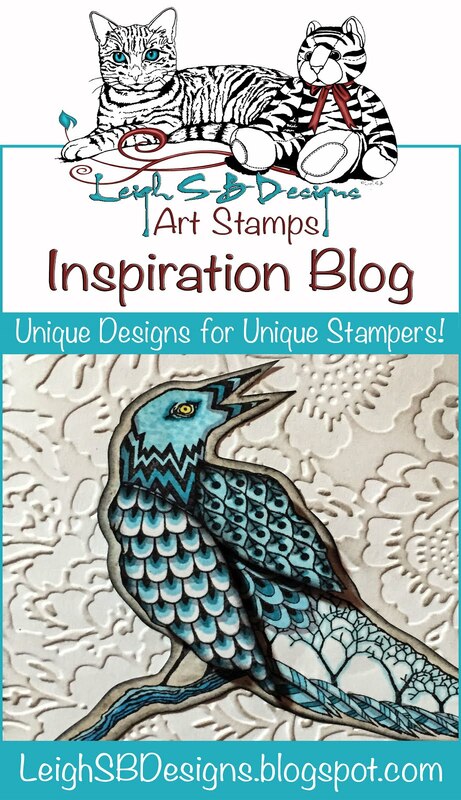 This addition to the blog hop is beyond gorgeous. Such impressive details, too. 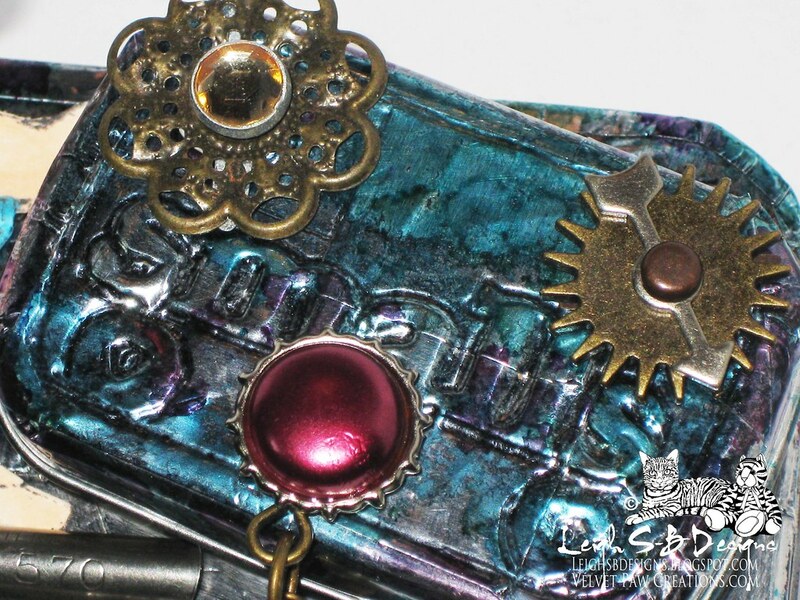 I am in awe of your use of all the steampunk inspired pieces, including that piece you used as a winding element. 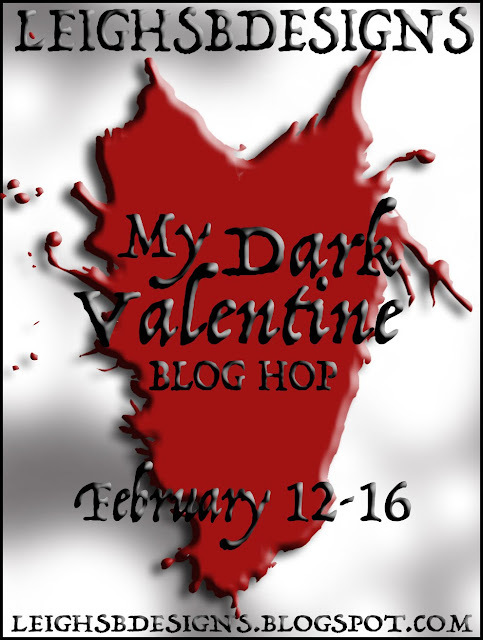 And of course, by using two tins, you put this blog hop on the map!! I love it! Steampunk Ella is great!!! Crazy AWESOME piece! I love the double tin! Wonderful! I love the steampunk theme! 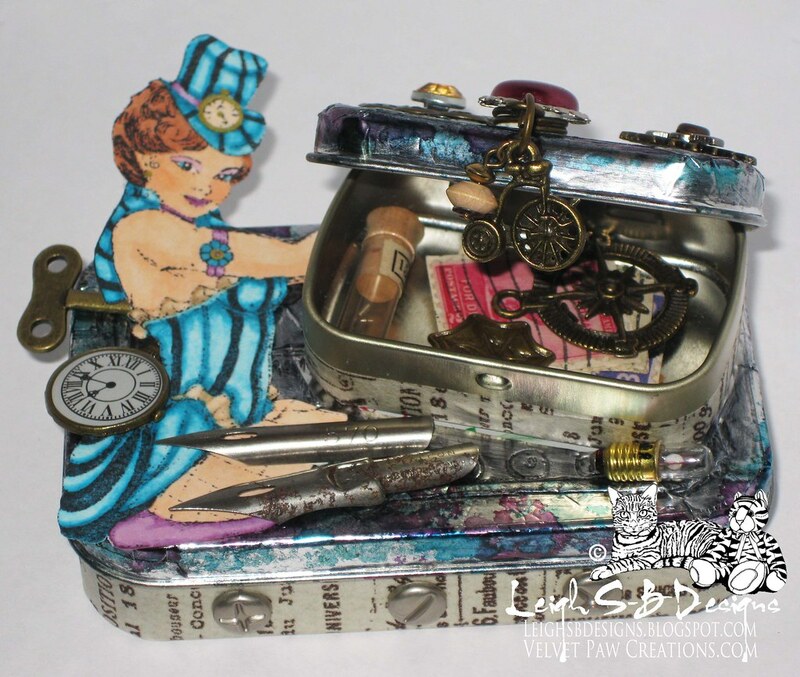 Darn spell checker doesn't like 'punked' but I do and this is one fabulously punked tin! This one is just too darling! Love the combo tins! This is sooo neat! I love it! 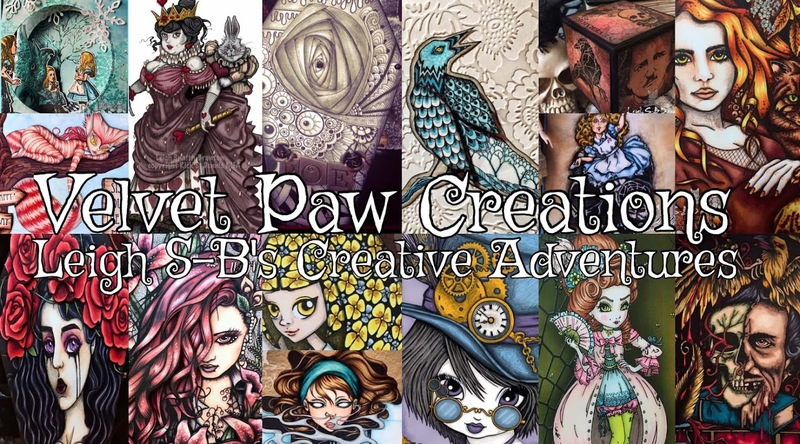 wow this is awesome I love the steam punk and your art always rocks! Awesome!! Love the tiny tin on top! The steampunk looks great with everything you used! Sorry for the late visit for the hop, but I was away on vacation last week when the hop posted and I'm catching up now on visiting everyone! 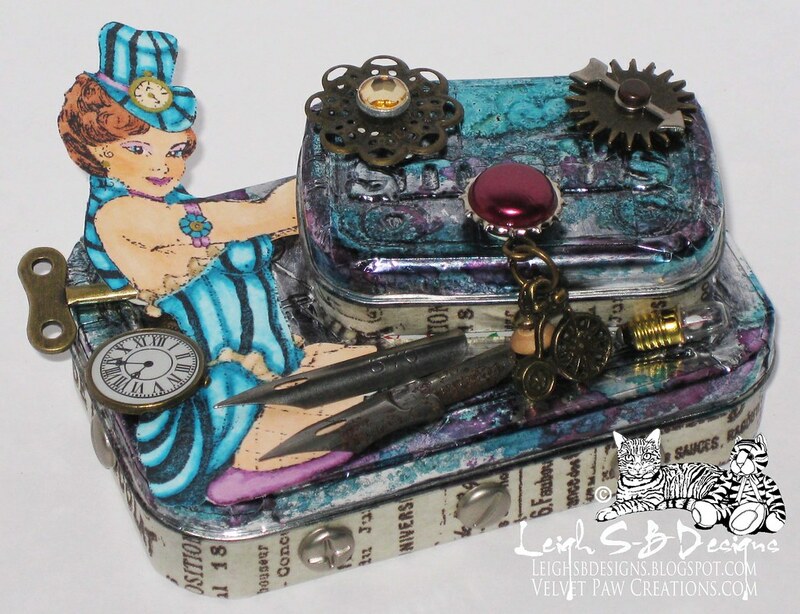 Leigh your steampunk tins are wonderful!